Cars, trams, buses, cyclists, people running and strolling around. The center of Rotterdam can be a busy place. Of course Rotterdam has a number of landmarks you must have seen before you go home. 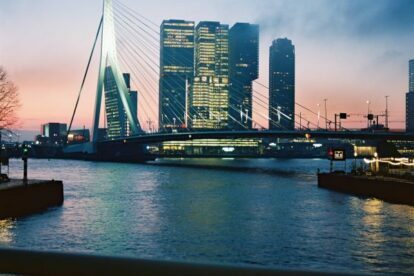 For example: The Rotterdam, the Erasmusbrug and the Willemsbrug. From the Leuvehoofd you can admire them all whilst laying in the grass or sitting on a wooden bench at the edge of the river the Maas, day or nighttime. During the years the city of Rotterdam initiated various projects to improve the Boompjeskade, not always a success. A few years ago the city initiated another, with success this time. They decided it was about time to create more green areas along the Maas to make it more attractive and open for people to hang around. Even though a good bar or terrace is still missing, the Boompjeskade has become an excellent spot to admire the city skyline, the bridges or a spot to empty your head from all the daily craziness. The Leuvehoofd is located at the end (or beginning) of the Boompjeskade and seems to be ignored by many. Bad luck for those who don’t know about it, an advantage for you. It’s a great spot to have some lunch, read a book or take a nap in the grass. Thanks to the trees around you and the river in the front it feels like you’re all alone in the big city.